The impact of video game technology on architectural visualization has the potential to be immense. Video games have come along away. From Pong, to side scroller’s like Super Mario Brothers, to the latest movie quality first person shooter Call of Duty franchise release. Games these days drop you into virtual worlds that not only look visually stunning but all you to explore these environments with free will. In contrast, when architectural visualizations do manage to step outside the standard rendered 3D still images and into a moving 3D world, it is almost always through a ‘set camera path’ video animation. 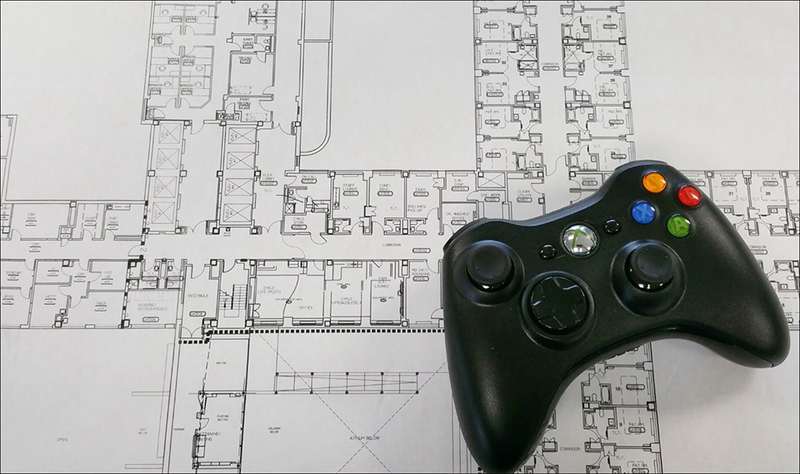 Why can’t the AEC world share a building design with a client by allowing them to explore the building with a controller in the same fashion the video game industry offers in 1st person games? After all, communication of a buildings design is one key to success and this perspective is ultimately how the end-user will be experiencing the building in the real world. As the video game industry has continued to push the envelope and evolve with its technological capabilities, the architectural world of visualization has lacked the software strides or want that would allow results in comparison. While it is clear that this isn’t an exact apples to apples comparison in industries, few can argue that even a small multi-million dollar building designed to last a lifetime vs a video game with a shelf life of a few years shouldn’t be that far apart in virtual experience as they share the same behind the scenes digital tangibles. The current state of 1st person video games allow you to run around first person perspective style in digitally modeled cities complete with realtime lighting, mega seamless textures, high scale detailing, and enough realism that is it is very clear of what environment you are exploring while at the same time as giving you the free will to explore it. Meanwhile the AEC industry’s tools can’t manage a virtual 1st person experience of a single building sans the game plot lines, inter-game physics, and virtual world depth. Not all is lost. Architectural visualization software has been making some progress as the video game industry has slightly turned its attention to the AEC industry and is now employing its video game engines for rendering purposes. This cross industry transition shows recognition of a hole that needs to be filled. This progress has been slow to come along and it has been kept independent of the AEC standard 3D modeling software suites as these programs run as standalone ‘end of the line’ type uses. Hope does lie in the fact that the AEC software giant Autodesk has recently acquired a video game engine as a future tool to bridge the gap between AEC modeling and game dev. Looking at a reverse cross industry solution – the best purely video game development software option looks to be Unity. Unity is free, allows numerous exporting options (.html, .exe, Xbox, Playstation, and Iphone/Android), has a huge user base, is very established as an industry leader in the video game world, and has been setting itself up to integrate with the emerging virtual reality sector. The task with Unity is that at its heart it requires computer programming skills. Architects and engineers are a lot of things, C# and Java programmers they are not. The software is there but the common practice is not feasible to the AEC masses. BIM models need to be optimized and converted with an inherent understanding of polygon/vertex counts, draw calls, material conversions (shaders), scripting, and complex lighting language/material baking among other things. This all translates to new workflows, additional ‘out of comfort level’ software training, computer programming skills, working with assets, and having enough general knowledge to know what you are trying to accomplish in order to troubleshoot and piece together the high-end results the AEC industry should be chasing. The learning curve is steep and there are many roadblocks to navigate the process. So what now? It seems at this time we are faced with 3 options: 1) the AEC community needs to start viewing it’s game developer counterparts as a type of visualization consultant to perform the work 2) wait for Autodesk to give us a magic ‘export to 1st person navigation’ button; IE do nothing or 3) forge new ground with the likes of a Unity. Our clients are waiting, there is a need. Myles M. Martin is a project architect at Rozas Ward Architects in New Orleans. You can follow him on twitter @M3arch.